A new report from the Governors Highway Safety Association (GHSA) indicates that motorcycle-related fatalities are projected to have topped 5,000 in 2015. This reflects a 10% rise over the number of motorcycle related fatalities from 2014. Generally, fatalities related to motor vehicle accidents decrease each year, as car manufacturers develop and implement new safety features and accidents thus become less deadly. However, there have been fewer improvements to motorcycle safety, and in fact greater pressure to soften the laws mandating helmet wear while riding. 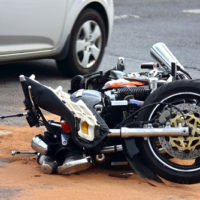 As a result, the annual number of motorcycle fatalities has remained fairly steady over the past ten years, hovering between a low of 4,400 in 2009 and a high of 5,300 in 2008. In fact, the number of motorcyclist deaths on US roadways has actually gone up by 50% from the mid-1990s, during a 20-year span in which the overall number of roadway deaths has gone down by 20%. 2015 is slated to mark only the third year on record that motorcyclist deaths have surpassed 5,000. New York was one of the 31 states which saw its number of motorcyclist fatalities rise in 2015; the GHSA estimates that 156 motorcyclists died in accidents in 2015, which marks a 16% increase from 2014. The GHSA attributes the increase in motorcyclist deaths to several major causes: an increased amount of motor vehicle travel, warm and dry weather, lower fuel prices, and improved economic conditions. The GHSA and other safety advocacy groups also note that a number of states have recently repealed their universal helmet laws, which has likely been responsible for a substantial portion of the increase in biker deaths. Helmets have been found to reduce the risk of dying in a motorcycle accident by 37%. Another common cause of motorcycle fatalities is motor vehicles violating oncoming motorcycles’ right of way, due to the smaller visual target motorcycles present. Bikers are encouraged to take proactive steps to protect their own safety on the road. The GHSA noted that one important improvement to motorcyclist safety is the increased availability of antilock brakes. This feature can keep a bike more stable and can prevent a motorcycle’s wheels from locking during sudden hard braking. Riders should seriously consider investing in a bike with this feature for their own protection. Responsible riders should also always wear a Department of Transportation-compliant helmet and high-visibility safety gear while on the road, and avoid driving at reckless speeds or while intoxicated at all costs. If you or someone you love has been injured in a motorcycle accident by a negligent driver, get the compensation you need to recover by contacting Hudson Valley personal injury law firm Rusk, Wadlin, Heppner & Martuscello for a free consultation, in Kingston at 845-331-4100, and in Marlboro at 845-236-4411.